The Taliban announced Tuesday they have withdrawn from Kunduz, the northern Afghan city that briefly fell under insurgent control last month. The Taliban said the reason for pulling out of the city was to protect against further civilian casualties, but there are multiple reports of battles continuing outside of the city. 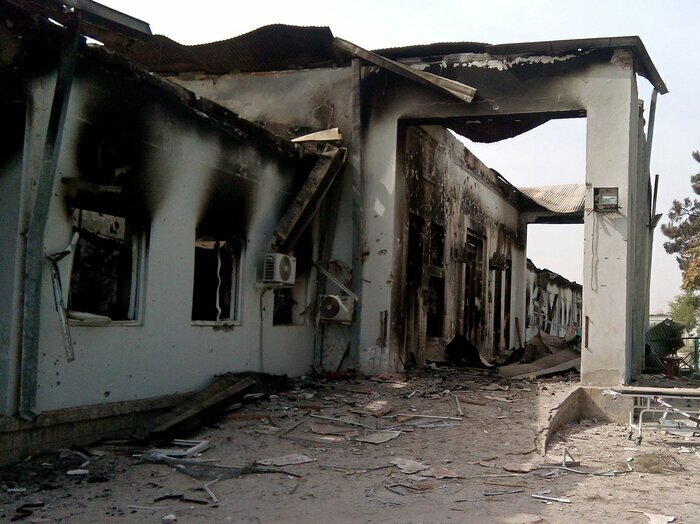 Kunduz is also the site of a U.S.-led airstrike that hit a Doctors Without Borders hospital and killed 22 civilians. NPR&apos;s Tom Bowman tells our Newscast Unit, Kunduz was the first major provincial capital to fall under Taliban control in 14 years. "The Taliban said in a statement they have achieved all their objectives: Seizing the major transportation hub of Kunduz, releasing its fighters from a prison [and] grabbing tons of weapons. "The statement, placed on a website associated with the Taliban, said the assault on Kunduz proves they can move on cities all around the country. "Afghan forces were able to retake Kunduz, with help from American commandos and airstrikes. But one of those airstrikes led to a mistaken hit on a hospital, killing some two dozen health workers and patients." In recent weeks, Kunduz has seen a well-coordinated, multi-pronged attack from Taliban fighters who converged from different directions, stunning Afghan security forces. The Taliban held control of the city for three days before being pushed back. "Taliban insurgents were present on the outskirts of the city, and were mostly holed up in the Chahar Dara district, a longtime stronghold, Jungulbagh said. "After two weeks of fighting, local people are venturing out and shops are open again, said Sultan Mohammad, 32, a Kunduz resident. He said electricity was being restored but problems with the water supply remained. "Exact numbers of dead and wounded are unclear, but believed to be in the hundreds. The Public Health Ministry has said that more than 60 civilians have been killed, and around 800 wounded in the fighting." The fall of the city was a major stumbling block for Afghan security forces which have had difficulty keeping insurgent fighters at bay since the U.S. and NATO took on more of a support role there last year. White House Press Secretary Josh Earnest praised the Afghan forces&apos; ability to turn the tide against the Taliban. "The fact that they were overrun in Kunduz in the first place was a setback, but their ability to regroup and retake the city is an indication of the resilience and capability of the Afghan security forces," Earnest said. As the Two-Way reported last week, the top U.S. general in Afghanistan, John Campbell said Afghan forces advised they were taking fire from Taliban insurgents on Oct. 3 and asked for U.S. air support. He told lawmakers during a Senate Armed Services Committee a Doctors Without Borders a hospital in Kunduz "was mistakenly struck" by U.S. planes. The U.S., NATO and the Afghan governments have launched investigations into the airstrike. Doctors Without Borders, also known as Médecins Sans Frontières, has called the incident a "blatant breach of international law" and a war crime. It has also called for an independent investigation. For his part, President Obama spoke with Doctors Without Borders President Dr. Joanne Liu last week. In a statement the White House said, "President Obama expressed regret over the tragic incident and offered his thoughts and prayers on behalf of the American people to the victims, their families, and loved ones." A preliminary report on the incident could be released this week.